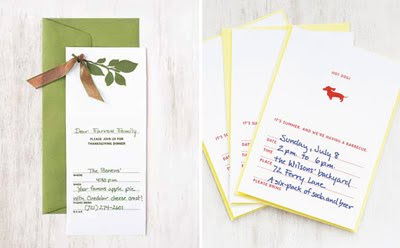 Real Simple magazine offers an assortment of free invitations to download and print. Mom, I'll be waiting for one of those Thanksgiving invitations in the mail. With a ribbon, please. You mean you inform me you're coming and you still expect an invitation?!?! Okay... that one did catch my eye, too. Check your email. Um, thanks. Your invitation looked looked exactly like the picture and even had a ribbon on it. Ha, ha. BTW, your comment contained a bit of redundancy. those are darling and love your little conversation with Grandma G...cute! ha! is that a dachsund i see?? too cute. Yipee, I am so happy to see these. I love your links to free printables. I always use them too.